Bradley Manning spied for us. 50th anniversary March on Washington. Growing an artificial heart. Save Chicago public schools rally. iPhones made by iSlaves? Fast food workers strike: the third wave. CNN's Carol Costello and Christine Romans report on the third wave of fast food workers' strikes in a dozen cities. 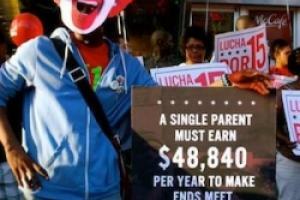 Fast-food workers one day strike spreads to many cities. Workers at MacDonald's, Taco Bell, Popeye's, Long John Silver's and other restaurants hold one day strike demanding higher wages.